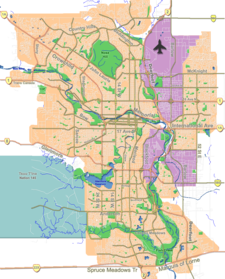 Silverado is a residential neighbourhood in the southwest quadrant of Calgary, Alberta. It is located at the southern edge of the city, south of the Spruce Meadows Trail and east of the equestrian sports facility Spruce Meadows. Its eastern boundary is Sheriff King Street, although the 2007 edition of Sherlock's Map of Calgary shows it extending to Macleod Trail. The map also shows an as-yet unbuilt major road, 194 Avenue S.W., forming the community's southern boundary. Silverado is represented in the Calgary City Council by the Ward 14 councillor. Prior to the commencement of development of Silverado, the owners of nearby Spruce Meadows pushed for a wetlands development to be established between the residential area and the show-jumping facility. Calgary City Council approved the wetlands proposal in 2004, along with a request that one of the major roads leading into Spruce Meadows not be upgraded to a residential collector street, although Spruce Meadows was unsuccessful in getting the City to increase the setback between Silverado and the facility. Construction of homes in the community began in 2005. In the City of Calgary's 2012 municipal census, Silverado had a population of 5,136 living in 1,898 dwellings, an 18.4% increase from its 2011 population of 4,337. With a land area of 5.1 km2 (2.0 sq mi), it had a population density of 1,007.061,007/km2 (2,608.272,608/sq mi) in 2012. ^ City of Calgary (2008). "2008 Civic Census Summary" (PDF). Archived from the original (PDF) on 2011-06-11. Retrieved 2009-04-26.